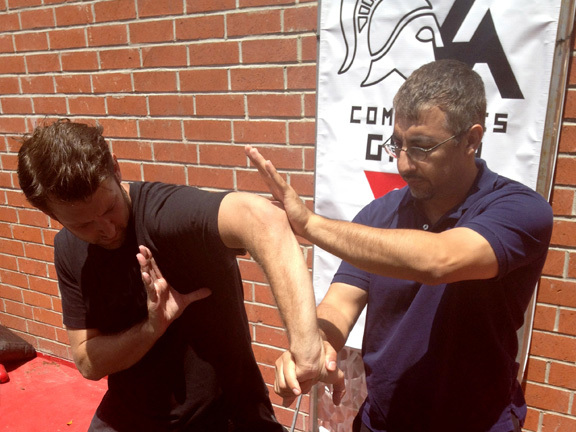 Turn your body into a sharp weapon in the LA Combatives Striking System. Through diligent training, you will become confident and effective through effective offense & solid defense.. Applying 5 ways of attack, you will become proficient in using your whole body as a weapon. as you transition through every range of combat. Curriculum includes effective and efficient use of kicks, punches, finger jabs, elbows, knees, shoulder and forearm strikes, as well as headbutts. Gain control through effective grappling for realistic, treacherous terrain and unsafe environments. Some grappling is focused on what works in the ring or on the mat. At LA Combatives Group, our grappling is designed for hard and realistic environments such as parking lots, stairways, and other urban environments that aren't equipped with mats or other padding. Learn how to effectively take your opponent(s) to the ground without having to go there yourself, whether they are armed or not. Results based weapons training tested & proven in jungle warfare during WWII. The training of choice for Special Forces teams around the world, learn authentic Filipino Martial Arts used and proven dominant in the harsh jungles of the Philippines during WWII. Be effective against any weapon, weather it it long or short, sharp or blunt in any environment. Learn how to deal with more than one armed opponents , to stay ahead of the attack and end a violent encounter before it begins.